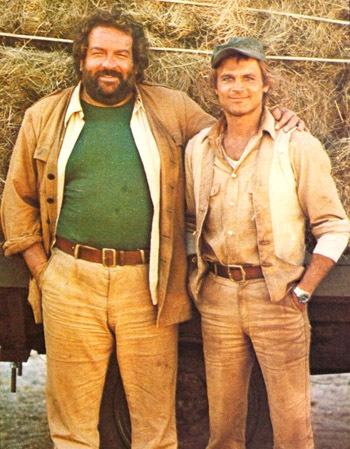 In this part of the page I want to tell you from my perspective how the congenial duo Terence Hill and Bud Spencer was born and tell you some inside stories around it. In this first part, I look back at the early days. In future parts and updates I will add here and there some new stuff and deepen some topics. The publication of a web video series, in which I will address amongst other topics, the duo and my friendship with Terence is planned as well... stay tuned! Life definitively writes the strangest and most wonderful stories. In this regard I can consider myself as a lucky and blessed person, life was very good to me! I was in the middle of a personal and professional transition when Giuseppe Colizzi contacted me in 1967 and he offered me the role of “Hutch Bessy“ in his film “Dio perdona... io no! (God forgives... I don't!)”. After a lot of thinking and many doubts, I accepted to play the role, never even guessing to participate in a second movie. A young man named Mario Girotti was hired the day before the start of the shootings as a replacement to another actor who had an accident and broke his foot. His role was called “Cat Stevens” and when the filming started we only had the time to briefly say “Hi!” to each other. 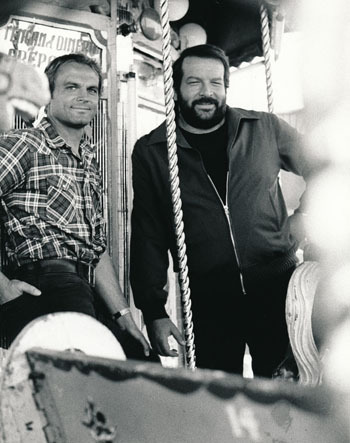 Neither one of us could ever imagine that this was the beginning of a new wonderful story in our lives: the friendship of Mario and Carlo, the birth of Terence Hill and Bud Spencer as inseparable duo on and off the movie screen! I was a bit too fast... let’s go a few steps back and get the things sorted out right, there’s much more to tell. Actually, the story of Mario respectively Terence starts beforehand. You know what, let’s use the names Terence and Bud from now on because the birth of these two characters also marks the beginning of a new wonderful chapter of my personal life. We were in the same business circles for some time – but we have never met. Terence always remembers when, as a young amateur swimmer, he would come and watch his idols training. We never had a chance to meet then, first because he was a teenager at that time and secondly because my training was always very fast and lazy. A few years later and still very young, Terence become active as an actor for quite some time, therefore he was frequently working in Cinecittà Studios (Rome) where most of the Italian and international productions took place. I lived in Rome at that time, had worked a bit as an actor, played mini roles in films but was active mainly as a composer. Later I worked in my own small production company and many time I assisted my father in law, Giuseppe Amato who was one of the most active film producer in the 50’s and 60’s. Therefore I was often to be encountered around Cinecittà. Terence and I must have crossed paths many times but destiny had decided for us that it was not yet time for us to meet. In 1959 for example, I just came back to Rome from Venezuela and was hired for the role of “Rutario” in the epic film “Annibale (Hannibal)”. Terence was also hired for this film, he played the role of “Quintilius”. We were both in the same film, but we didn't even see each other once during the filming as we had different days of shooting for our scenes. In 1967 the time had finally come, we have been selected for the roles of “Cat Stevens” and “Hutch Bessy” in “Dio perdona... io no! (God forgives... I don't! )” directed by Giuseppe Colizzi. I can remember the first time I met Terence on the set as if it was yesterday. I sat there and went mentally through my role. Everybody was very nervous because of the accident occurred to the actor that was meant to play the co-star. I was not nervous because for me it was just another experience in life without a lot of meaning and also because the actor that suffered the accident was a little arrogant and I don’t get along well with arrogant people. So I was taking it easy when suddenly Terence stood in front of me and introduced himself: “Ciao, I’m Mario, I am pleased to meet you...”. He sat down next to me and we went through a few scenes together. A polite, friendly and modest person who told me his admiration for my sport successes. Blue eyes and contagious smile, the kind of man that mothers wish as husband for their daughters. I immediately felt a great sympathy for him. I think he felt the same, we had an intellectual connection to each other, human as well as professionally. He had a lot of experiences as an actor so our ways of playing the characters and the approach before the shoot was very different but the fundamental human values were exactly the same. These synergies were immediately noticed by the director Giuseppe Colizzi. He understood right away that our type of characters complemented each other perfectly and he could play around with us. Terence was always well prepared for his daily scenes and his roles, he studied the script until late at night and instead of having dinner with the crew, he sometimes stayed in his room thinking about ways to improve the next day work. On the other side I have rarely waived a dinner, I was lazier in preparing my scenes and since I never studied to be an actor, I was more instinctive and my past sport activities and my physical characteristics helped me a lot. Being so different we had no jealousy nor enviousness for each other. On the contrary there has always been a lot of respect among us. We both had a very common private life and success didn’t corrupt our minds nor the way we behaved. We were then hired to play together in two other films directed by Giuseppe Colizzi, in 1968 “I quattro dell'Ave Maria (Ace high)” with the great American actor Eli Wallach who was so patient to teach me a lot of tricks to be a better actor and in 1969 “La collina degli stivali (Boot Hill)”. Both films were successful and with each of them our friendship on set grew and I learned more and more to appreciate Terence as a very positive human being. Giuseppe Colizzi prepared the ground for the highest grossing film of 1970. Terence and I were popular but still not a professional couple on our own. Enzo Barboni, a renown director of photography of many important films had the intuition to create a new type of “Italian Western” with more humor and gags and no dead people; he wanted to direct the film himself. For “Lo chiamavano Trinità... (My Name Is Trinity)” he had collected numerous refusals from producers: “the concept does not work, there is too much dialogue and not enough action, the audience wants to see shootings and deaths” – these were the kind of reactions he had been told over and over again. But he knew what he was doing and was determined to stick to his ideas and then, when he finally showed the script to Italo Zingarelli, Italo was excited from the first moment and decided to produce the film. They offered the main characters, “Trinity” and “Bambino”, to Terence and myself and we felt really well in those boots. With E. B. Clucher on the set, we had a lot of fun, the roles were cut for us and Enzo accepted a lot of our ideas to improve the daily shooting. Our west was a fantastic valley between the mountains in the center of Italy and even though the budget was pretty small we were really motivated to do a good job. Between the shooting we played football and eat together in a relaxed atmosphere. We had a great time, everything was just right and the story would not be complete without mentioning our great team of stuntmen guided by a fantastic stunt coordinator, Giorgio Ubaldi. The film hit the big screen in 1970 and was an unexpected huge national and international success becoming the highest grossing Italian film worldwide, beating the previous record of “La dolce vita” produced ten years earlier by my father in law Giuseppe Amato. The success was so wide that Cinemas had a lot of problems to contain the enthusiasm of the audience with many people who remained seated after the show and wanted to see the movie over and over again. Some of my oldest fans told me they saw the film seven or eight times in a row during the opening weekend in 1970. A growing wonderful team of actors, stuntmen, crew members from that moment on, would be together in many films in the future. We all felt we had achieved something great with the generous contribution of everybody. Do you know “Murphy's Law: Anything that can go wrong, will go wrong.”? 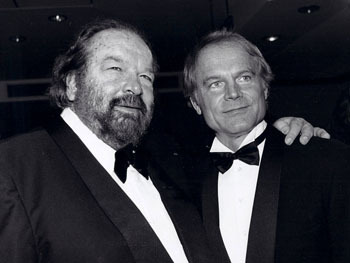 The story of Terence Hill and Bud Spencer is a kind of “Murphy's Law” simply reversed. A chain of lucky events and coincidences, everything was just perfect! In retrospective, It is very difficult to explain such luck! Between 1971 and 1974, Terence and I did five more films together: the sequel of Trinity, “...continuavano a chiamarlo Trinità (Trinity Is Still My Name)” topped the success of the first one and made international movie stars. We then accepted to work again with Giuseppe Colizzi with an extremely low salary as a sign of gratitude in a film he was directing and producing. We traveled to Colombia to interpret two airplane pilots in “... Più forte ragazzi! (All the Way Boys! )”, one of my favorite films. My passion for flying started there. Afterwards Terence had a great success with “Il mio nome è Nessuno (My Name is Nobody)” acting aside Henry Fonda and then he decided to try an experience in Hollywood and made a film with Gene Hackman. 1973 I did the first film as Commissioner Rizzo in “Piedone lo sbirro (Flatfoot)”, one of my all time favorite roles. I really enjoyed working in Naples, my home town, directed by Steno, one of all time greatest Italian directors. We both proved we could be very successful on our own and there were other three blockbuster sequels of the saga of Flatfoot. In 1977 we were offered another fantastic script from E.B.Clucher and we did our first movie in Miami as two improvised cops. “I due superpiedi quasi piatti (Crime Busters)” was another incredible international success. Until 1985 almost every year a new movie with us came out. The friendship with Terence had grown year after year greater and greater parallel to our popularity together. We regularly met and still meet today for a Spaghetti and Tomato dinner cooked by my wife Maria. Terence and his wife Lori say it is their favorite. I can only say it was a blessing for me to meet and be friend with Terence Hill!